Lowertown Reading Jam will be presented on Wednesday, January 28, from 7:30 to 8:30 p.m. at the Black Dog Coffee and Wine Bar, 308 Prince Street in Saint Paul. All ages, no cover, donations welcome. Food and beverages for sale. 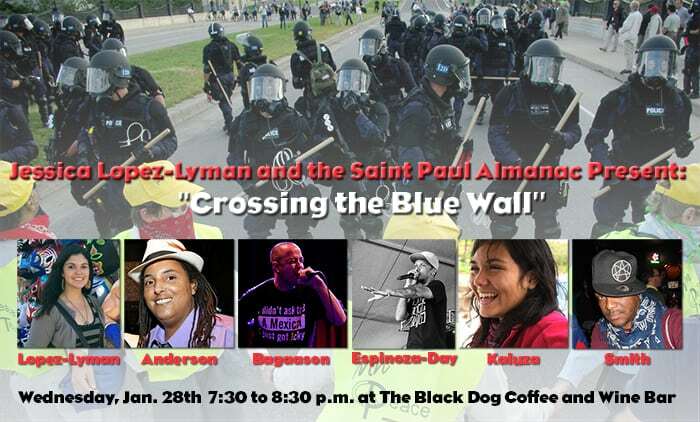 The “blue wall” is the impervious police/military state that brings destruction and injustice. Recently, we have seen resistance to the violence of the blue wall in the United States through the Black Lives Matter movement springing forth in Ferguson, New York, Oakland, and other places across the country. Similarly, in México, the murder of forty-three student teachers from Ayotzinapa has evoked a movement against militarized state violence. Our reading is dedicated to the Black and Brown people who have lost their lives. Together we cross the blue wall. Together we rebel in order for it to fall. Jessica Lopez Lyman was born and raised in St. Paul. As a poet/organizer turned graduate student, Jessica believes deeply in the transformative power of art. She is currently working on a multi-media performance piece, Hair Volume, an intergenerational and cross-racial exploration of women and gender non-conforming people’s relationship to hair. She has performed at First Avenue, Movimiento de Arte y Cultura Latino Americana (MACLA), and at the Mujeres de Maíz festival, to name a few. Jessica’s work is inspired by feminists of color and fueled by Tapatio hot sauce. For more information visit www.jlopezlyman.com. For over twenty years, Roxanne Anderson has been a community activist and arts organizer. Anderson is the co-founder and director of RARE Productions, a multimedia arts and entertainment company focusing on producing and promoting queer artists of color. Anderson is an emerging writer, most recently performing at Queer Voices: An LGBT Reading Series. Anderson was most recently honored with the 2014 Outfront MN Legacy Award and the 2013 University of Minnesota’s Community Excellence Award. Roxanne is co-owner of Cafe SouthSide and lives in South Minneapolis with her partner, Anna, and their dogs, Lila and Jazper. Brandon “Allday” Bagaason is a fourth-generation Minnecano, hip-hop performer, producer, educator, and co‐founder of the Minneapolis-based rap‐duo Big Quarters. Big Quarters’ releases include: Cost of Living (2007, noted as “Best Hip-Hop of 2007” by the Star Tribune and Popmatters.com. ); Zip Disks Break (2007); Fall In Love, EP (2008); From the Home of Brown Babies & White Mothers (2009); Zip Disks Break II (2009); Party Like A Young Commie (2011); and Somos No Joke (2012). Brandon’s debut chapbook release Chicano Futurist (2014) is available now. Brandon Allday has shared stages with Cee-Lo, Slum Village, The Coup, Rhymesayers, Doomtree, and Heiruspecs. He is faculty at McNally-Smith College of Music in Saint Paul. Felipe Espinoza-Day (Felipe Cuauhtli) is a percussionist, poet, and hip-hop emcee. A community-oriented performer, teaching artist, and educator, he is a member of Los Nativos, a St. Paul hip-hop duo established in 1996, sporting a conscious message and style that adds political motivation, community awareness, and current events of the world while integrating hip-hop, jazz, funk, rhythm and blues, Tejano, mariachi, salsa and cumbia. As a musician, Felipe has traveled throughout the United States and Mexico performing with The Roots, Ozomatli, RUN DMC, Atmosphere, and The Black Eyed Peas, to list a few. His work bridges his Chicano, Black and indigenous identities. Magdalena Kaluza is a Minneapolis native, daughter to a Guatemalan immigrant and a South Minneapolis activist. She was fortunate to grow up with a city lot-sized vegetable garden in the Phillips neighborhood, and to travel to Guatemala often as a youth. Magdalena graduated from Stanford University in 2013. She spent her high school and college years doing anti-war, immigrant rights, and labor organizing, all while riding her bicycle and going to dirty punk shows. She is a member of Palabristas, Minnesota’s Latin@ spoken word collective. Last winter, Magdalena was in Guatemala doing educational work with an organization aimed at reclaiming dignity for indigenous and ex-guerrilla communities, followed by a summer where she “got buff” interning on an organic veggie farm in Wisconsin. Magdalena believes that the more media creation and storytelling we do, the better – especially in the face of the trauma and injustice brought upon us by capitalism. She would love more queer women of color in her life. Upon the realization of certain truths, Jaméz L. Smith began writing at the age of twelve. At eighteen, he DJ’d his first party. An honorably discharged veteran of the United States Air Force, Jaméz earned degrees in applied electronics and occupational education. Jaméz is an administrative professional with thirty-seven years of experience working in government, corporate, and other environments, including the past fourteen years in the nonprofit sector. Currently, he works for Minneapolis Public Schools as the Assessment Coordinator at Southwest High School. A published poet whose works appear in The Road Before Us: 100 Gay Black Poets, Sojourner: Black Gay Voices in the Age of A.I.D.S., and others, he continues to write poetry, DJ, and explore as he hopes for continued realization of certain truths.